If you really want to know what you're letting yourself in for at Castagnola , then probably the first thing to do is read our ' WHAT OUR VISITORS HAVE SAID' page - the second thing is to get out here! We're high up on a hill, about as remote as you can get without going wild. Our woods are full of wild boar and we're really lucky to have a family of eagles nesting up there too. Most of our terraces are used for organic farming of olives, fruit and vegetables. We use much of our own produce for breakfast & dinner and the Gazebo is a perfect eating spot. Leo makes a wicked 'melanzane parmigiano' ! 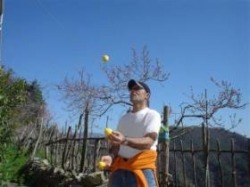 We look forward to being able to welcome you to Farmhouse Castagnola 64 Bed & Breakfast! PESTO LASAGNA OR LA CIAPPA ?